In our last post, we discussed the importance of the Second Amendment as well as its purpose and intent. It is imperative to understand why our "Founding Fathers" included this right. Because it is so difficult to remove or even alter Constitutional Amendments, those who are against this right desire to weaken it by changing its purpose and intent. Patriotic Americans must defend this right because it provides a defense for every other freedom that we enjoy afforded by this document. If we allow the purpose and intent to be questioned and altered, there is really no limit to what can be done to any other part of our Constitution. Brave, courageous citizens gave much (some gave all) to provide these freedoms for their posterity. It is our responsibility to ensure their sacrifice is valued in our generation. To be concise, we'd like to offer a couple of ways in which the average person can help defend this valuable right. First, there is strength in numbers. Even simply signing up for an annual membership in the National Rifle Association is beneficial to making our political representatives aware that gun owners are a strong and "voting" segment of their constituency. If you have the ability, become more involved by contributing time or financial resources to organizations like this that work hard to defend not only this right, but our Constitution as a whole. Being informed of the possible threats to this right is something anyone can do... we have listed some links here that will take you to websites where you can get more information on how you can help defend and strengthen the Second Amendment. ﻿﻿﻿﻿﻿﻿﻿﻿ I don't know of a better or easier way to defend this right than to simply be a responsible gun owner. Those who wish to assault this right love to portray firearms owners as illiterate idiots who are a threat to the safety of the general public. Of course this is false, and we must make this caricature impotent. This can include making sure the things we say and how we act cannot be used to strengthen or give the slightest legitimacy to their argument. It also requires that we pass on a love for this right and how we "enjoy" it to our children and future generations. Make a resolution this year to become more active in supporting and defending the Second Amendment by being informed, joining with other firearms owners, and teaching someone about the importance of this right and how to enjoy it. 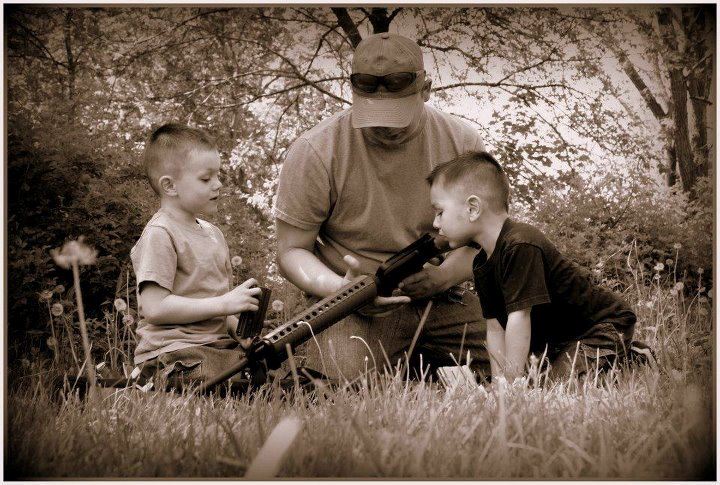 Pass on your love for firearms and the shooting sports to the next generation. Teach them about the purpose of the Second Amendment. It is likely their generation will have to support and defend it too. Thanks for reading our blog. 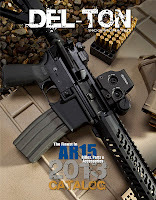 If you have any questions about Del-Ton AR-15 rifles or the products we sell at www.del-ton.com, please feel free to contact us. Proponents of gun control call them "assault weapons". Other specifically designed terms are also used in describing AR-15 rifles, such as "military-style, automatic weapons". I suppose the purpose in choosing these terms is to place the weapon in a negative context. The possibility of new gun control legislation has once again caused a "run" on semi-automatic weapons, magazines, and the ammunition related to these weapons. In the last five years, demand for firearms and related products has risen due to concerns about the right provided by the 2nd Amendment of our Constitution being altered, weakened or even removed. There is a definite "assault" occurring, on the Constitution in general, and this Amendment in particular. In this two-part blog post, we will take a concise look at what the Amendment says, why it was created, and how we can protect and strengthen it now and in the future. The Amendment quoted at the beginning of this post seems pretty clear, when taken literally. The second half of the sentence informs us that the right of the People to keep and bear arms shall not be infringed. It is a right, just as the other rights guaranteed by the document are rights. In fact, if we look at the first part of the sentence, it is likely the most important right because it protects the other rights provided...but more on that later. 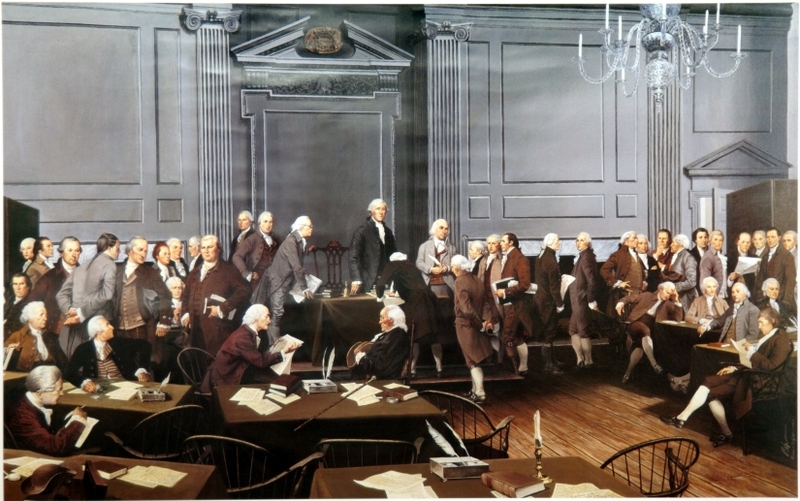 It is when one views this document as dated, fluid, or open to interpretation that it becomes less clear what was meant by the authors, those who signed it into law, and the states that ratified it. It is clearly stated that it is a right provided to the People. Just as the other rights in the document are afforded to individuals, so it is with this one. 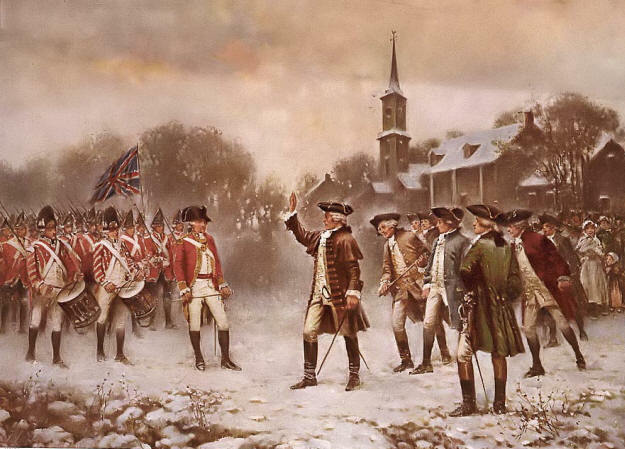 Gun control advocates attempt to alter this right by saying the "militia" (mentioned earlier in the sentence) means that it is not a right for the general populace or citizens, but only for an organized military force (a national or state army). This does not coincide with all of the other rights provided by this document which pertain to individuals...the People. This thought does bring us to the purpose or intent of the Amendment, though. The basis for this Amendment is not so we can enjoy hunting, the shooting sports, or the aesthetic art of a fine firearm. It was designed to ensure the security of a free state and protect it from those who would prefer it not be free. This is important to comprehend. 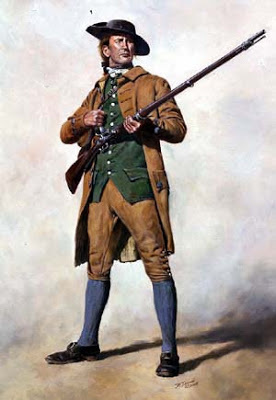 The citizens of Colonial America were not relegated to keeping and using firearms designed solely for hunting or target sports. No distinction was made because there was none to make. These individuals used their weapons for multiple applications. The weapons were the most modern and advanced that technology and their financial affairs allowed. Defending the state and ensuring its freedom begins with individuals having the capability to defend themselves and ensure their individual freedom. The AR-15, like any gun, is a tool. An inanimate object is not good or evil. It is the user of the tool that determines whether it will be used for good or evil purposes. While the design of the AR-15 is similar to what it currently being used by our military forces for the defense of freedom, owners of AR-15 rifles use the weapon for defense, hunting, shooting sports...various applications. It performs in an outstanding manner in all of these ways. 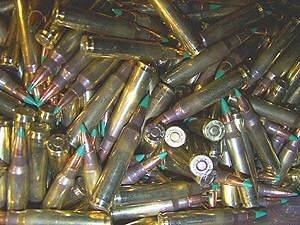 That favorite deer hunting caliber, the .30-06, was a military round designed for use in the "Great War" and used to defend our nation against tyranny by our soldiers in WWII. The Mauser bolt action, used by many current hunting bolt action rifles, was originally designed and refined for military purposes. There is a long and valuable history of most of our favorite firearms being originally designed for military purposes, yet later employed for other applications with great success. So anti-gun individuals can use whatever misnomer they desire to attempt to influence the minds of individuals that there exist "good" or "bad" guns...what remains is a clear and precious document provided for us for such a time as this. 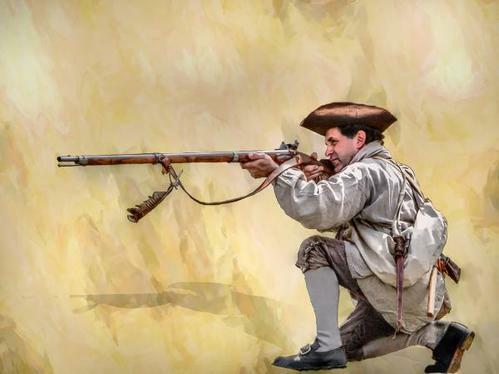 The 2nd Amendment, as written, is invaluable in forming a strong basis to defend this right and the other rights provided to us by those who risked everything to ensure liberty. It is our responsibility to enjoy our rights by first protecting and defending them. Our next blog post will offer ways that we can do this and links to help us inform ourselves and others. Thanks for reading our blog. 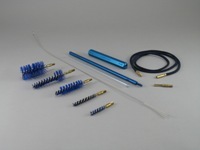 If you have any questions about any of the products we offer at www.del-ton.com, please contact us. Its a very small part on the rifle, but a proper muzzle device can enhance your weapon in practical and aestheic ways. 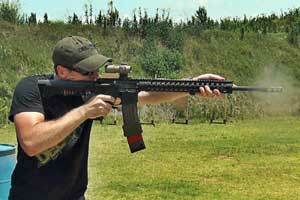 There are three main types of muzzle devices for the AR-15: Flash Suppressors, Compensators, & Muzzle Brakes. 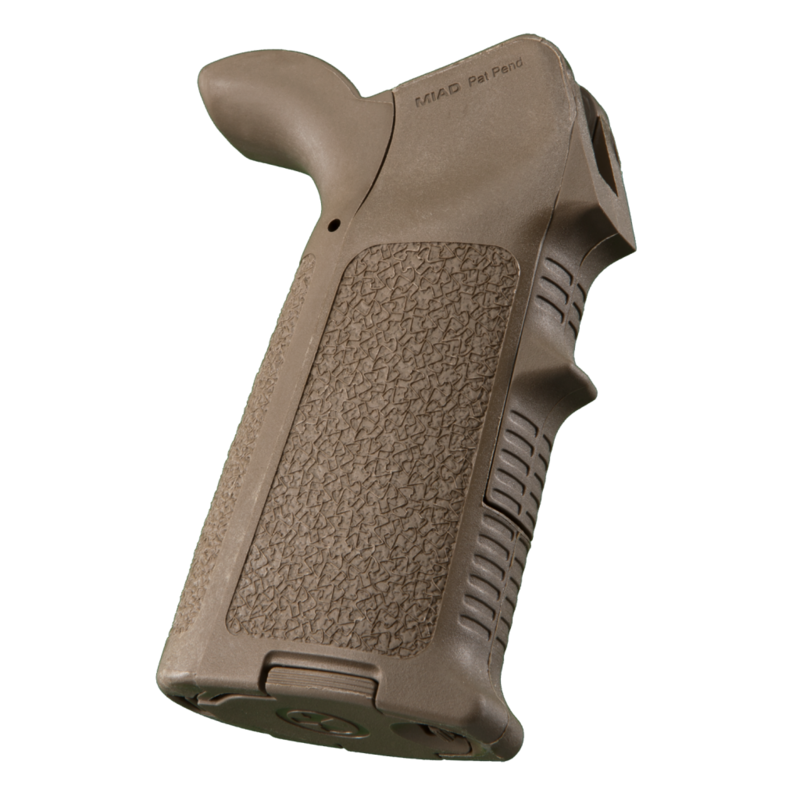 While there are some differences of opinion on what qualifies a muzzle device to "fit" in the mentioned categories, and manufacturers sometimes blur the defining line even more, we will use this opportunity to define each category as best we can and show what DTI offers for those interested in selecting the best device for their weapon. As with any part you choose for your rifle, your application (how you will use the weapon most of the time) should be the determining factor. Flash hiders or flash suppressors do reduce the muzzle flash in comparison to a plain muzzle or most muzzle brakes. 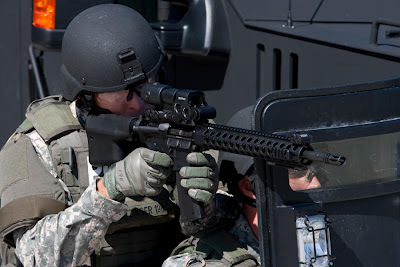 Depending on the style, they may or may not offer benefits in reducing "muzzle climb" (when rounds are fired, the muzzle of the barrel tends to rise off target). Models with vents on the top of the device would be best at providing this benefit. A1 flash hiders have vents all the way around the device, while A2 flash hiders have vents only on the top of the device. DTI offers these standard flash hiders as well as popular models from manufacturers likeVltor and Yankee Hill Machine. Compensators almost always have features like a heavier weight or vents positioned to fight muzzle rise. 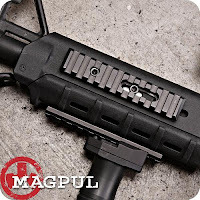 Due to their design, they may not reduce the flash signature as well as flash hiders, but they still reduce it better than a plain muzzle or a muzzle brake. Their main benefit is to reduce muzzle rise and keep the weapon on target for fast follow up shots. 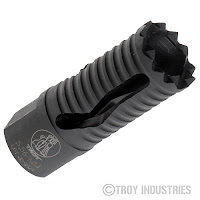 Some people consider the standard A2 flash hider to actually fall more into the compensator category of muzzle devices, and there is some merit to this when one considers the design. Like many current muzzle devices, the YHM Phantom 5C2 compensator pictured here has a crenulated end for use as an impact weapon. Muzzle brakes are designed to reduce recoil. This is typically accomplished by venting the gas that follows the bullet out of the muzzle in a sideways or rearward direction. 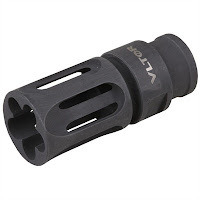 The vents or ports are designed to direct the gas in this manner and as a result, flash signature and noise are significantly increased with most muzzle brakes. This directing of the gas or blast can also provide the benefit of fighting muzzle rize and keeping the weapon on target. Some states are still "under" the 1994 Assault Weapons Ban, and a muzzle brake is the only allowed device. It is usually required that these be pinned and welded (permanently attached) as well. Local gun retailers or your state's Department of Justice website should have information as to what is required in your locality. Many muzzle devices like most in the YHM line are also long enough to make a 14.5" barrel a legal 16" if pinned and welded so a prospective owner can have a shorter barrel without violating NFA laws and registering the weapon as a SBR (short barreled rifle). Thanks for reading our blog. If you have any questions about muzzle devices, the parts and weapons we sell, or anything about the AR-15 rifle please feel free to contact us. Our customers have requested a suggested procedure for the 'break in" of the barrel on a new DTI rifle. 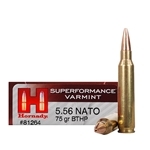 While opinions on the necessity of this and the steps involved vary, performing the following tasks on a new weapon will not cause any harm and may increase initial and long term accuracy. DTI rifles, rifle kits, and complete upper assemblies are all test fired at the factory. Like any new weapon, it is always a very good idea to perform a general cleaning of the upper, bolt assembly, and barrel before using it the first time. Before starting break in, 20-40 rounds of jacketed ammunition and a cleaning kit (including solvent and lubricant) should be obtained. Using a solvent containing ammonia that does not have any oil in it will aid in removing any oil from the barrel and properly prepare the steel for the "break in conditioning". 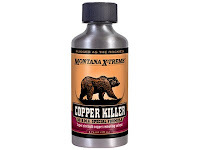 These cleaning products may have a strong odor, but break in cleaning should be done while at an outdoor range so this will aid the dissipation of the scent. 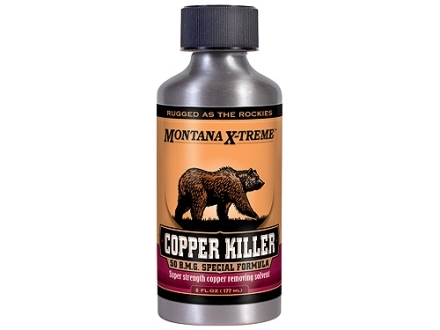 Popular solvents from manufacturers like Montana Xtreme, Butch's Bore Shine, or Sweet's 7.62 Solvent will prepare the barrel and remove carbon and copper from the barrel left by the fired rounds. Step One: Cleaning the barrel with this same type of solvent should also be done after each shot for the first ten shots. Whether you use only a solvent soaked patch or a patch and a brush, a dry patch should be passed through before firing the next shot. In the interest of safety, always make sure there is no foreign material in the bore before firing the weapon. It is suggested to allow the barrel to cool in between shots so that, in the future, it will be less likely for shots fired in succession to "move" dramatically as the barrel warms. Step Two: Once the initial 10 shots have been fired and a cooling period/cleaning with solvent has been performed in between each shot, two shots may be taken with the same type of cleaning done previously for another 10 rounds. Once this series is finished, a thorough cleaning (including a light lubrication of the inside of the barrel, if it will not be used for a period of time) should be completed. Various or more extensive break in procedures similar to the one described in this post may be beneficial, but following these two steps will ensure that the "burnishing" process is complete. Proper maintenance of your DTI AR-15 (cleaning after each shooting session, and intermittently when stored for long periods of time) will provide longevity of service and enjoyment of your weapon. 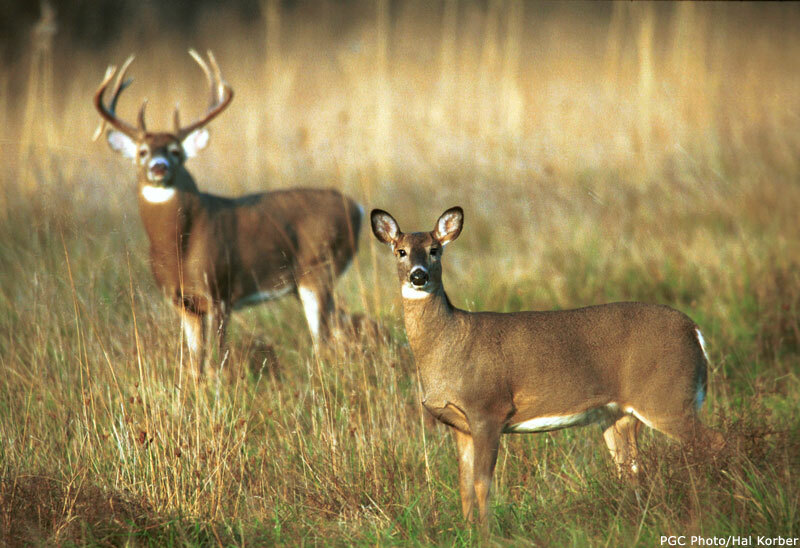 Always make gun safety a priority when shooting or even handling firearms. Thanks for reading our blog. If you have any questions about DTI rifles, the products we offer, or anything related to the AR-15 rifle, please contact us. Depending on your application, the standard or F-marked front sight base found on a "stock" AR-15 may not be the best option. It works, and does it well. However, if you want to install a low magnification scope-low on the upper receiver or desire to increase the sight radius on a carbine or mid length, a different gas block may be the better choice. 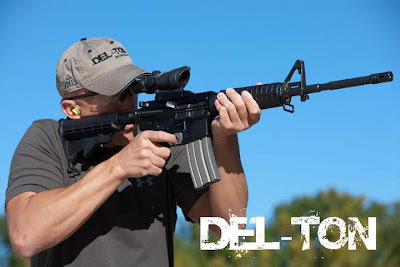 In this post, we will discuss gas block types (we will put them in 3 categories) offered at Del-Ton and which ones would best fit the way you use your rifle. The first type we will discuss is the low profile gas block. These are typically a small, steel cylinder that mounts with set screws or clamp screws at the bottom of the part. DTI carries a couple of models from brands like PRI, Daniel Defense, and YHM. There is also an adjustable model from PRI that can help ensure the proper amount of gas is channeled for cycling with supressors or different ammunition types. 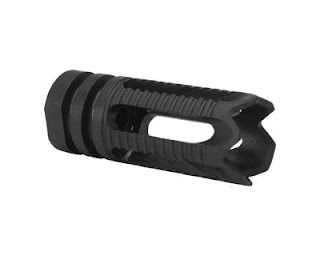 One of the main benefits of this style of gas block is that it allows for the use of a longer free-float handguard on the particular gas system. If you have a carbine gas system, a mid-length or rifle-length handguard can be installed that runs well past the gas block. This allows additional room for mounting accessories and a longer sight radius if a flip up front sight is used on the handguard. 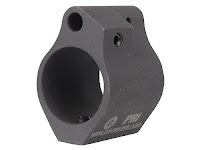 Railed gas blocks can be beneficial in that they provide M-1913 picatinny rail space for the addition of sights or accessories directly to the gas block. Because heat can be transferred to the gas block, only accessories made of metal should be attached. It is important to remember to select a front sight designed for a gas block so that it will properly align with rear sights (typically, the top rail on gas blocks is a bit lower than those on railed handguards). DTI carries single rail (one rail on the top), two rail (one on top, and one on the bottom), and four rail gas blocks in this style. 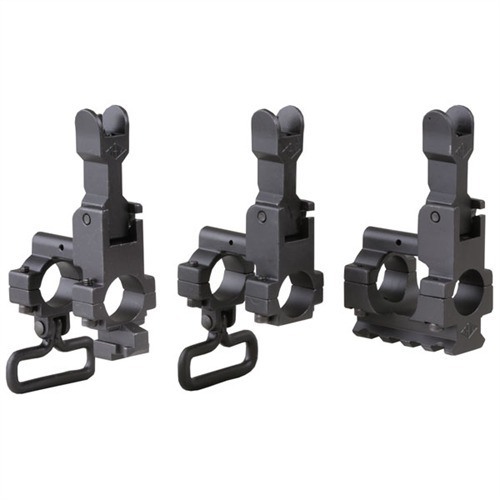 Again, the main advantage here would be no fixed front sight to disturb the sight picture of optics with low magnification or a low mounting profile. The final type of gas block we will discuss is those that come with a flip up sight on the part. This can be a definite money saving opportunity. DTI carries models from YHM, PRI, Vltor, and A.R.M.S. that allow you to use the iron sight when it is in the up position or folded down so that a clear, unobstructed view can be obtained. They may cost a bit more than the models with rails, but with the sight included they end up being more cost effective. Installation of these is simply a matter of removing the muzzle device and the front sight base. DTI front sight bases are installed with taper pins and these should be driven out from the bolt assist aside of the weapon. A larger punch should be used first to get the pins "moving" and then a smaller punch can be used to finish tapping them out. A front sight base bench tool, like those sold at Brownells, is extremely handy for this task. Be sure to remove the gas tube roll pin and gas tube gently so that they can be reused if needed in the gas block (however, this is an excellent time to install new parts if you are concerned about their condition). It is typically easier to install these in the gas block before mounting the gas block on the barrel. It is also important to note that a low profile gas block may not cover the mark in the barrel where the front taper pin was installed. Most of the railed and flip up front sight gas block models will cover both of the marks left by the taper pins for a more aesthetically pleasing appearance. Finally it is imperative to make sure the gas block is properly aligned over the gas port and in line with the upper receiver to ensure proper functioning. Thanks for reading our blog. If you have any questions about the gas blocks we carry or any other AR related questions, please feel free to contact us. One of the most popular "upgrades" AR-15 owners make to their weapon is to install a different handguard than the basic two piece one that came on their rifle. While the standard handguard is comfortable and functional, choosing a handguard that better serves the application in which you use the weapon can be of great benefit. 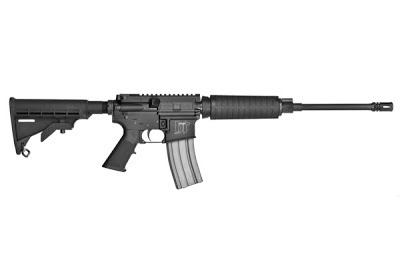 There are two main types of handguards for the AR-15: two piece, standard handguards and "free float" handguards. 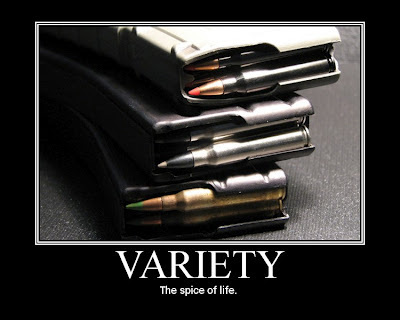 In this post we will discuss these options and how they can help you enjoy using your rifle to its full potential. The standard, two piece, plastic handguards that come on the weapon may be just fine for many uses. Even if you desire to attach various accessories to the weapon, a free float handguard with picatinny rails may not be necessary. With the basic two piece handguards, a strip of picatinny rail can be placed underneath the bottom handguard for accessories like a vertical grip. However, Magpul's MOE handguards offer slits at the 10 o'clock and 2 o'clock position as well; rail sections can then be mounted in these positions for accessories like lights, lasers, etc... 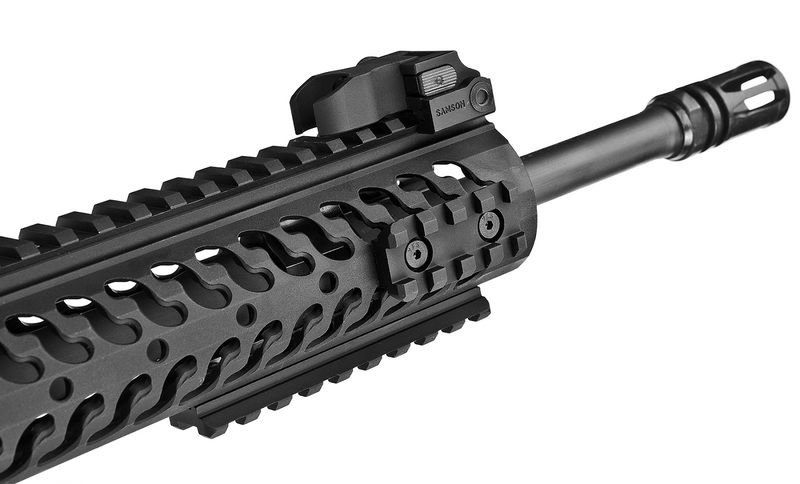 The MOE handguard also has a "ledge" on the bottom of the handguard for use as a hand stop for those who prefer an extended support hand position. Manufacturers like ERGO and Magpul offer strips of polymer or aluminum picatinny rail in various lengths to accomodate a set-up like this. If more rail space is needed for the attachment of accessories, it would be wise to choose a 2 piece, 4 rail handguard. 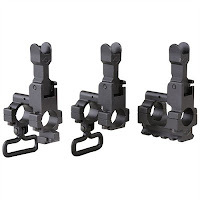 These are not "free-floating", and attach the same as standard, 2 piece handguards, but provide unlimited space for whatever you need to mount on the rails and still have room for comfortable support hand positions. The main benefit of the free-float handguard is that it does not contact the barrel in any place; this can prevent inaccuracy caused by stress of parts put on the barrel and barrel harmonics. Most free float handguards attach to the barrel and upper via a jam nut that replaces the barrel and delta ring assembly on a standard handguard system. There are some manufacturers, like Daniel Defense, that still use the delta ring assembly on some models of free float handguards. 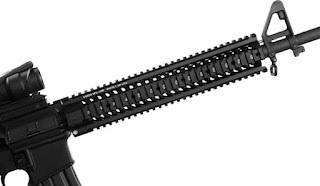 Many free float handguards have 4 rails that run the full length of the handguard, while others have a smooth tube that has attachable rail sections near the front. 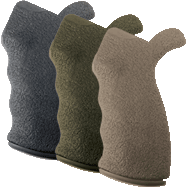 These can provide more comfort than handguards with four rails running the entire length, and still allow important accessories to be attached where they are most likely to be used. For target shooting or hunting applications where lights and lasers are not beneficial, a completely smooth free float tube without rails may be the best choice. For handguards that do have full length rails on all sides, rail covers can help mitigate any discomfort from the sharp edges of rail sections where accessories have not been mounted. Installation of standard two piece handguards and some "drop-in" free float handguards is easy and requires no special tools. By simply pulling the delta ring assembly to the rear, the two piece handguards can be seperated and removed. Installation of the new ones is typically easier if the top handguard is intalled first, with the front being inserted under the endcap before placing the rear of the handguard under the delta ring. Many free float handguards will require removal of the front sight base, existing barrel nut, and installation of the free float jam nut-this does require having some AR gunsmithing specific tools. 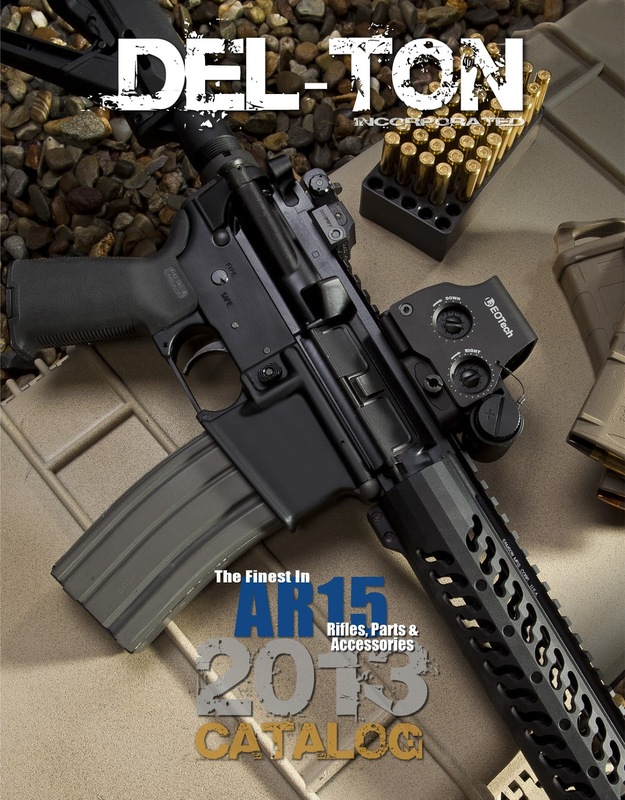 Having options to best meet your weapon's intended use is what makes the AR-15 such a popular weapon. If you have any questions about handguards, options, or anything related to the AR-15 rifle please feel free visit our site via the highlighted links or contacts us. We would love to assist you in choosing the best parts to outfit your rifle so that it provides you with service and enjoyment! It is important to have some basic knowledge about the AR-15 in order to enjoy the weapon and keep it functioning to its full potential. 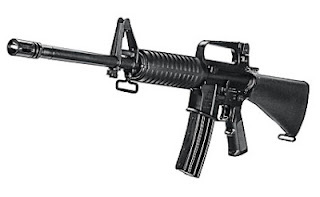 The AR-15 is a fairly simple weapon to keep clean and maintain, as far as semi-automatic weapons go. 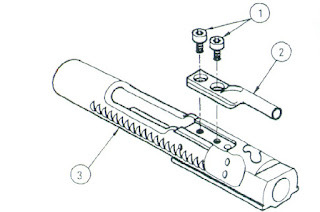 In this post, we will go over some very basic information about the bolt and carrier assembly, including dissassembly and maintenance. Most AR-15 rifles will have either an AR-15 or M-16 bolt carrier. The bolt will be the same in either instance, but the M-16, or "full-auto" carrier is a bit heavier than the AR-15 model due to its design. There is a larger "cut-out" at the bottom of the AR-15 model. While an M-16 carrier alone will not make the weapon full-auto capable, some AR owners believe that having the heavier M-16 carrier is beneficial in carbine gas sytem rifles; it is thought that the extra weight can slow down the cycling of the weapon. The standard, mil-spec carriers sold at DTI have a chrome lined interior. A fully chromed model is also available. Coatings like chrome, titanium nitride (TiN), nickel boron, etc... can make the parts easier to clean and provide lubricity and wear resistance. A standard, phosphated, mil-spec carrier will work fine and can provide the average owner with a lifetime of service if it is properly maintained. Atop the carrier (3), is the carrier key (2) that also has a chrome lining. The carrier keys used in DTI products are attached with grade 8 carrier key screws (1) and the key is "staked" according to military specifications. This involves making an indentation in the metal of the key on both sides of each screw in order to preven the screws from easily backing out during normal operation of the weapon. At DTI, we use bolts machined from carpenter 158 steel. Each bolt is then high pressure tested and magnetic particle inspected (bolts used in the DT Sport line of rifles are not individually HPT/MPI tested, but are made of the same material on the same machines as the bolts that do undergo this testing). The bolt is used to fire a high pressure round of ammunition (HPT) and then closely inspected (MPI) to search for any fissures or imperfections in the steel that may have resulted from the force of the excessive pressure. Factory ammunition is loaded with powder that creates pressures well below the those created by the HP rounds, so a DTI AR owner can feel confident that our bolt has the quality and integrity to provide functional and long-term usage. There are many opinions on what is necessary in regard to cleaning and maintenance of the bolt assembly, but it is definitely important to remove the bolt from the assembly for cleaning each time you clean your weapon. Doing so will only help keep things functioning right. 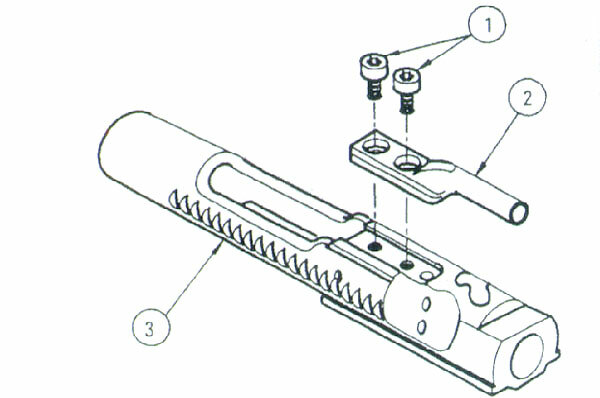 To remove the bolt from the carrier, first remove the firing pin retaining pin (1) from the carrier. Once this is done, the firing pin (2) can slide out toward the back of the carrier, and the cam pin (3) will rotate properly for removal from the bolt. The bolt (4) is then free to slide out of the front of the carrier (5). While the entire bolt should be gently cleaned, the "face" of the bolt, the tail end of the bolt, and the firing pin will likely have a fair amount of fouling and carbon build up that may require extra attention. Any solvent or solvent/oil cleaning solution can be used for cleaning. A firm, nylon bristle brush or dental pick may even be required depending on the amount of fouling that has built up. The pick can be used to ensure there is not a build up under the extractor as well. All external and internal surfaces of the carrier, carrier key, and cam pin should also be cleaned. Cotton swabs or pipe cleaners can be useful to get into the small areas, but there are some manufacturers like Iosso that make specialized nylon brushes for this use as well. The exterior of the bolt and exterior sides and bottom indented rails of the carrier should be lightly oiled before the entire assembly is inserted into the upper receiver. Cleaning after any shooting session or prolonged storage is always a great way to provide a long life for your AR-15. For additional information on this post's subject matter, please visit our retail website...here, you can also view exploded diagrams of these parts. If you have any questions about AR-15 bolt and carriers, DTI rifles, or anything about the AR-15 in general, please feel free to contact us.